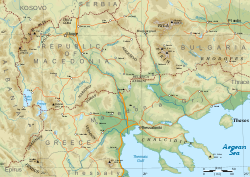 Macedonie ( i/mæsd[unsupported input]ni/) is a geografical an historical region o the Balkan Peninsula in Sootheast Europe. Its boondars hae chynged considerably ower time; housomeivver, it came tae be defined as the modren geografical region bi the mid 19t century. The day the region is considered tae include pairts o sax Balkan kintrass: Greece, North Macedonie, Bulgarie, Albanie, Serbie, an Kosovo. [a] It covers approximately 67,000 square kilometres (25,869 sq mi) an haes a population o 4.76 million. Its auldest kent dounsets date back approximately tae 7,000 BC. Frae the middle o the 4t century BC, the Kinrick o Macedon became the dominant pouer on the Balkan Peninsula; syne then Macedonie haes haed a diverse history. a. ^ Kosovo is the subject o a territorial dispute atween the Republic o Serbie an the sel-proclaimed Republic o Kosovo. The latter declared unthirldom on 17 Februar 2008, but Serbie continues tae claim it as pairt o its awn sovereign territory. Kosovo's independence haes been recognised bi 103 oot o 193 Unitit Nations member states. This page wis last eeditit on 13 Februar 2019, at 21:09.